Not surprisingly, that deprecatory view of the media did not interest journalists over the weekend. The NBC Nightly News, for instance, ran a full story Friday night on Sanchez's comments critical of Bush officials, but didn't mention what he said about the news media. CNN's Wolf Blitzer led the 7pm EDT hour of Friday's The Situation Room with how “Ricardo Sanchez says 'America is living a nightmare with no end in sight.' That's a direct quote. And he's sharply critical of U.S. strategy with stinging judgment of government officials.” The critique of the media didn't come up in the segment with Pentagon reporter Jamie McIntyre. Saturday's front page New York Times article, “Ex-Commander Says Iraq Effort Is 'a Nightmare,'” ignored the media angle while front page story in Saturday's Washington Post, "Ex-Commander In Iraq Faults War Strategy," didn't refer to the scolding of the media until the very last paragraph. Saturday's Good Morning America, however, briefly alluded to Sanchez's negative words for the news media, though “IRAQ WAR 'NIGHTMARE'; Ex-General Blasts War Effort” remained on screen as reporter Miguel Marquez related: “Sanchez blasted the media. He even recalled words that were used to describe him in reports during his tenure.” Sanchez: “'Dictatorial and somewhat dense,' a 'liar,' a 'torturer,' 'does not get it. '” But that was it, nothing about his broader take on the negative impact of the overall media coverage of the war. Strong words from retired Lieutenant General Ricardo Sanchez who, in a scathing speech, became the highest-ranking former general to criticize the Bush administration's handling of the war in Iraq. Some surprisingly harsh words today from the former top U.S. commander in Iraq, the first man to hold that job, in fact. 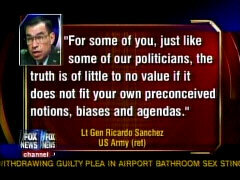 Retired Lieutenant General Ricardo Sanchez turned on the Bush administration, accusing it of a failure in Iraq. “Over the course of this war, tactically insignificant events have become strategic defeats for America because of the tremendous power and impact of the media and by extension you the journalist. In many cases the media has unjustly destroyed the individual reputations and careers of those involved,” end quote. “You are perpetuating the corrosive partisan politics that is destroying our country and killing our service members who are at war. “For some of you, just like some of our politicians, the truth is of little to no value if it does not fit your own pre-conceived notions, biases and agendas,” end quote Ricardo Sanchez. An earlier NewsBusters post has the text of the news media portion of Sanchez's October 12 remarks before a conference in Arlington, Virginia of the association of Military Reporters and Editors. The Web site for the group, which dubs itself “the official association of military journalists,” has the text of the entire address. BRIAN WILLIAMS: Some surprisingly harsh words today from the former top U.S. commander in Iraq, the first man to hold that job, in fact. 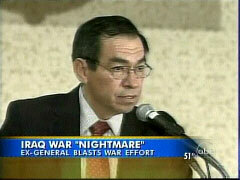 Retired Lieutenant General Ricardo Sanchez turned on the Bush administration, accusing it of a failure in Iraq. 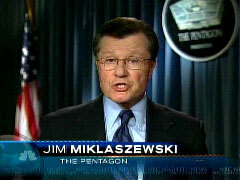 NBC News Pentagon correspondent Jim Miklaszewski is with us tonight for more on this story. Jim, good evening. JIM MIKLASZEWSKI: Good evening, Brian. Sanchez is the highest-ranking former top U.S. military commander in Iraq to openly criticize the war, and today clearly laid the blame squarely on the White House. 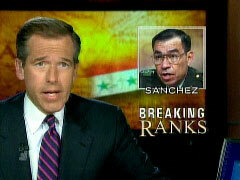 Lieutenant General Ricardo Sanchez took command of all U.S. forces in Iraq only two months after the fall of Baghdad. Now retired, he claims that even by then the U.S. strategy in Iraq was doomed to fail. And in a scathing speech today, Sanchez blamed the civilian leadership at the top. LIEUTENANT GENERAL RICARDO SANCHEZ: Who will demand accountability for the failure of our national political leadership involved in the management of this war? They have unquestionably been derelict in the performance of their duty. MIKLASZEWSKI: Sanchez acknowledged the military made mistakes, but, without naming names, put the lion's share of the blame on the National Security Council, the President's top foreign policy advisors. SANCHEZ: In my profession, these types of leaders would immediately be relieved or court-martialed. MIKLASZEWSKI: But Sanchez had his own problems. He was caught up in the Abu Ghraib prison scandal, and although he was cleared of any involvement, the scandal cost him a fourth star, and he was forced to retire. Still, Sanchez predicted today that even the current surge strategy in Iraq is headed for failure. SANCHEZ: The best approach we can do with this flawed approach is stave off defeat. MIKLASZEWSKI: Pentagon officials had no comment tonight, but some suggest Sanchez is clearly bitter over his forced retirement. Nevertheless, others believed that the facts on the ground in Iraq seemed to support much of the criticism that Sanchez laid out today, Brian. RON CLAIBORNE, 7:02am live feed: Strong words from retired Lieutenant General Ricardo Sanchez who, in a scathing speech, became the highest-ranking former general to criticize the Bush administration's handling of the war in Iraq. 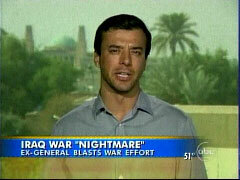 ABC's Miguel Marquez is in Baghdad with more. Good morning, Miguel. MIGUEL MARQUEZ: Good morning, Ron. It was a blistering speech from an unlikely source, the General who used to run things here. It was particularly odd in the timing of it because the administration had some of the best news out of Iraq recently in years. Lieutenant General Ricardo Sanchez was top U.S. commander here for one year. In an angry, and at times personal, speech about the news media and politics of war, he did not hold his fire. He says the latest plan for Iraq, the surge, will not work. LIEUTENANT GENERAL RICARDO SANCHEZ: From a catastrophically flawed, unrealistically optimistic war plan, to the administration's latest surge strategy, this administration has failed to employ and synchronize its political, economic and military power. MARQUEZ: During his tenure, we saw the capture of Saddam Hussein, the handing over of sovereignty to Iraqis and the scandal of U.S. guards abusing prisoners at Abu Ghraib prison. Sanchez blasted the media. He even recalled words that were used to describe him in reports during his tenure. SANCHEZ: "Dictatorial and somewhat dense," a "liar," a "torturer," "does not get it." MARQUEZ: Sanchez was criticized not only by the media, but by some in the Pentagon as well who felt he was in over his head as the commanding General of all U.S. forces in Iraq. The biggest problem with Iraq policy, says Sanchez, decisions about it are based on partisan politics. SANCHEZ: There has been a glaring unfortunate display of incompetent strategic leadership within our national leaders. As a Japanese proverb says, action without vision is a nightmare. There is no question that America is living a nightmare with no end in sight. MARQUEZ: Wow, it is just an amazing speech at this particular time. Sanchez retired a year ago under a cloud of controversy because of his part in the Abu Ghraib prison. He called himself another victim of Abu Ghraib. It should also be noted that he is currently writing a book. CLAIBORNE, 7:32am: A former top U.S. general in Iraq is criticizing the war as a nightmare with no end in sight. Lieutenant General Ricardo Sanchez says the current surge is a desperate attempt, his words, to make up for years of mistakes, but he says America has no choice but to continue our effort in Iraq.